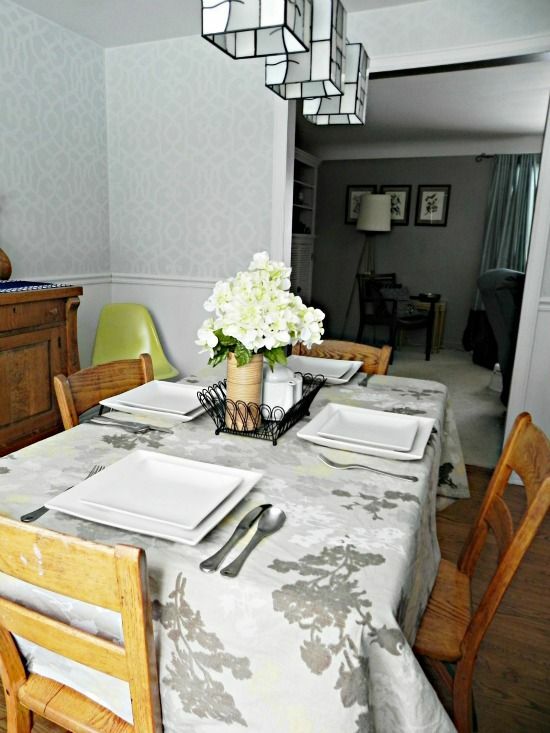 It occurred to me that, while I did show you the dining room post-stenciling, I haven’t showed you the finished room yet. It probably won’t ever be totally “finished” to me, as I am not sure whether I should hang more things on the wall or just let the Chez Sheik stencil (affiliate) speak for itself. But since the room was clean and it was a sunny day, I decided to snap some pictures for you to see! Oh, and read through to the end of this post for some EXCITING NEWS! In case you are wondering, we don’t do dining room rugs. Besides the added expense, they make the floor harder to clean and you have to worry about the whole chair-sitting-unevenly-on-two-surfaces inevitability. A rug would warm up the room a touch, but the cons outweigh the pros in my mind. I honestly did iron that tablecloth before I took these pictures. It’s default position is wrinkled and mussed, so let’s just go with it, okay? The oak table and buffet were my in-laws’ and they gave them to me as an engagement present (I know, right? ), but until we moved into this house we never had a place for all of the pieces. Now it all looks really lovely in our dining room. The buffet is great both for storage and for parties. 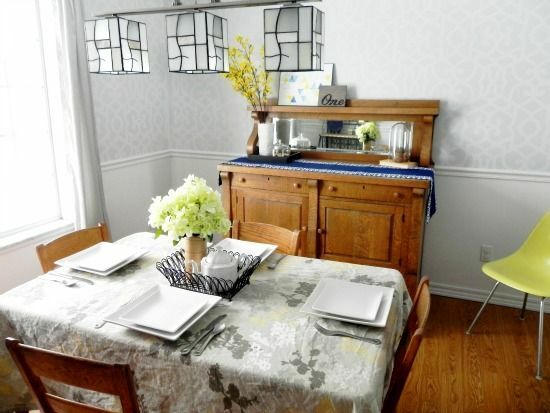 We can use it as an extra place for serving food or as a great place to set down birthday presents at the kids’ parties. If you follow me on Instagram, you got a sneak peek at that triangle artwork. I just painted it quickly with watered down acrylics. I haven’t made my mind up about it yet, but I like how it ties the colors of the dining room together. You might recognize the “One” plaque as part of my Upcycled House Number Wall Art. I haven’t found a place to hang the whole piece in The Mad House, so I am using individual plaques throughout the house. The runner on the buffet was another Goodwill find. It’s a gorgeous indigo blue with an Ikat border. 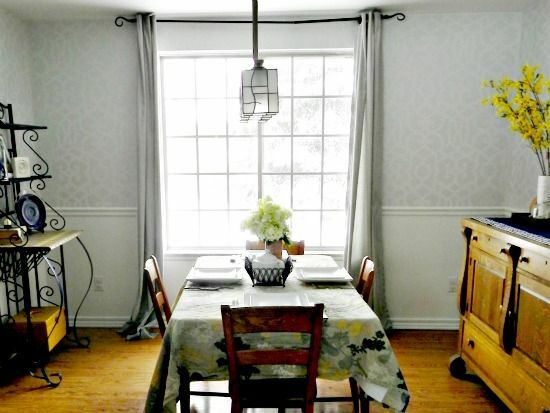 The dining room is the first room in the house where I feel I have successfully mixed prints: the large scale stenciled walls, the floral tablecloth, the Ikat runner, and the geometric stencil on the baker’s rack. Mixing patterns is not my strength, but I think they work. The light fixture was a STEAL! A steal, I tell you! My mom and I were out browsing at Lowe’s, and they had several of their fixtures on clearance. We had been living with capped off wires hanging from a hole in the ceiling since removing the ceiling fan last summer, so mom and I decided to take a look. We spied this beauty on sale marked down from $199 to $50! I was thrilled, but nervous, because it seemed that the display model was the last one left. The helpful Lowe’s worker took the display model down AND we got an additional 50% off because it was the floor model. THAT’S RIGHT! I scored that gorgeous light for $25! It was a good day. The tone-on-tone grey walls transition nicely into the greige walls of our living room. My dream is to be able to remove the horrible stained carpet in the living room and the laminate in the dining room and replace it all with hard wood, so the two areas really flow. A girl can dream, right? I moved the artwork from our previous home’s kitchen walls into the dining room here. So far, they are the only things hanging on the wall in the dining room. I think I will keep it that way… for now. There is a pocket door that can close the dining room off from the kitchen, which is particularly nice when the kitchen is a mess. I know most people nowadays are looking for open plan houses, but I have never really been on board with that. If I had to look at my kitchen all the time, I would scream. We moved the baker’s rack that I painted into the dining room as well. It is the piece in the room that brings the grey, blue, and yellow all together and is another place for me to add in some décor. Aside from my grandma’s fiestaware plate, not much on the baker’s rack screams “dining room,” but I am okay with that. I bought the hardcover books from a local thrift store just for the colors. Reader’s Digest Condensed Books tend to have really cool patterned covers, and these were only 25 cents a pop. I bought the Van Gogh print when my parents took me to NYC when I was still in college. It is my favorite Van Gogh painting, and the colors are perfect for the room. (PS Yes, it is my favorite. I might be the only person in the world that really does not care for his “Starry Night.”) The vase is filled with vintage flashbulbs from an old camera that my mom found in their storage. Pretty, right? I bought the the grey curtains at Goodwill for cheap and then did the old “hang the curtain rod as high as possible AND wider than the window to make the window look bigger” trick. The dining room gets the best light in the whole house, mostly because of that great window. Now for the dramatic before and afters! Mouse over these last three images to see what the room looked like when we moved in, and then mouse back out to see how it looks today! It’s a pretty decent change if I do say so myself. And now for my big, big news: I WAS CHOSEN AS A CONTESTANT FOR CREATING WITH THE STARS!!! I am so incredibly honored to be one of just 12 chosen because I STALKED those entries, and there were some amazing projects submitted. To those of you who showed support by clicking through my entry link, BIG BEAR HUGS! Seriously. You guys are the greatest. I don’t have any real details yet, other than that I have been paired up with Mandi from Vintage Revivals, which is enough to get me sufficiently geeked right there. Mandi has an impressive talent for being on the forward edge of home trends, AND she has a love for upcycled projects which is right up my alley. Plus, she won her season when she was a contestant on Crafting with the Stars, so she has champion blood in her veins. I am chomping at the bit to get started on some knock-your-socks off projects, so stay tuned for all the details! You have the same buffet table as my grandmother. In other words, you have the best buffet table ever! It looks great in your home. Oh, I love that! Thanks!